For indoor, greenhouse, and outdoor use. Pride Lands Premium Potting Soil is a ready-to-use soil that is suitable for all containers types. 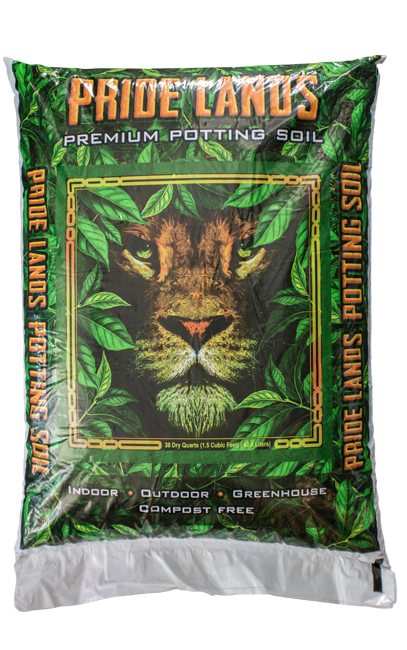 Pride Lands Premium Potting Soil holds moisture well in most enviornments. Coco fiber, sphagnum peat moss, peat humus, perlite, dolomite lime (pH adjuster), oyster shell (pH adjuster), feather meal, bat guano, fish meal, seabird guano, alfalfa meal, volcanic ash, blood meal, crab meal, fish bone meal, glacial rock dust, langbeinite, kelp meal. Water one to three times per week according to your plant’s needs. For best results, feed with organics and compost tea. We recommend using GreenGro Granular Plus Mycorrhizae when transplanting into Pride Lands soil.